A Matter of Class: Jason Bulmahn Talks PATHFINDER'S Advanced Class Guide! A Matter of Class: Jason Bulmahn Spills the Beans about PATHFINDER'S Advanced Class Guide! So you're the designer of the top-selling roleplaying game on the planet right now. How does that feel? Did you ever imagine that would happen? It’s crazy. I don’t think any of us here at Paizo ever really dreamed we would reach this level of success, especially not in the early days of the Pathfinder Roleplaying Game. Back then, we were more concerned with keeping the doors open, hoping that gamers would at least give us a shot. It was rough going at first. There were a lot of naysayers, but as the game came together, we started to realize that we had a winner on our hands. The release of the Beta Playtest Edition was the turning point, and its been a rollercoaster ever since. As for me, it still seems a bit surreal. I can’t believe I get paid to do this, and people thank me for my work. Is there a theme to the classes in the ADVANCED CLASS GUIDE? You've mentioned before that each of the ten new classes is a mix of two existing classes. Could you explain a little about what that means? When the concept for the Advanced Class Guide came together, we took a look back at the magus from Ultimate Magic. We liked how the class blended mechanics from two existing classes, adding a new spin to give you a unique play experience. It’s sort of like multiclassing, but without all the mess. With the Advanced Class Guide, we wanted to expand that concept. The end result is 10 classes, each one being a blend of two existing classes. Take the bloodrager for example: This class is a blend of sorcerer and barbarian. A bloodrager can enter a furious rage, similar to a barbarian, but he can also cast a limited number of arcane spells while doing so. Of course, he also has a bloodline, but the powers are focused on combat, rather than spellcasting. When designing a product like ADVANCED CLASS GUIDE, what's your process for deciding what makes the cut? How do you decide which classes to include and which to drop? Is there much discussion or disagreement during that process? Our team kicked around a lot of ideas during the design process, looking at different class combinations to see what sort of conceptual and mechanical design space was out there. Ultimately, the ones that made the cut were those that lent themselves to a strong concept. To that end, a class like the swashbuckler was a simple choice. It’s a concept that everyone can latch onto with relative ease. Once we had that, coming up with the rules components to match was relatively simple. Were there any classes which didn't make it into the book for some reason? Either just as ideas, or as fully-fledged material. Are any of these likely to see the light of day at a later date, in some form or other? There were a few ideas that got cut as we narrowed the list of classes down to 10. Generally speaking, they got dropped because they were the weakest in terms of concept or they were something that might work better in a later book, grouped with others in a theme. It would not surprise me if a few of them found print at some point in the future, but that depends on what books we decide to put out in the coming years. What—to you—defines the difference between a Pathfinder class and an archetype? I mean, obviously they're different mechanical entities in the rulebooks, but what is the difference in a design or narrative sense? How do you decide which is which? Whenever we’re coming up with a new class element, be it an archetype or a full-fledged class, we strive to find two key elements: a strong mechanical niche and a strong story niche. If an element has both, it tends to be slotted to become a full-fledged class. If it’s not as strong in one of the categories, it still has a chance as an archetype. For example, we might envision a character that is a master at acrobatic moves and capable of attacking foes from unexpected angles to gain an advantage. While I think that’s a decent conceptual niche, the mechanics for it are pretty well covered by the rogue. In the end, that would be slotted to become an archetype, building off what the rogue has to offer. Better to follow that course than to attempt to create brand new mechanics that are trying to do the exact same thing. Ultimately such design just invites comparison that is going to result in imbalances in the rules. Some classes in the Pathfinder RPG are clear standard fantasy archetypes. Others are strong archetypes from other genres—the ninja, or the gunslinger, for example. Are there any of the latter still waiting to be tapped? Any genres you'd like to sprinkle into Pathfinder with a light dusting of a class or archetype? I think there are a lot of genres out there worth exploring, but those would need more support. To look at the extreme example, we would have a hard time doing science fiction classes without a lot of support material to make them work. Most genres fall somewhere between that extreme and your more usual fantasy fare. I would love to get around to exploring the horror and steampunk genres a bit, assuming I can find the right book to put them in. Is there any upper limit to the number of classes you should include in the Pathfinder game, or do you feel that the list is essentially open-ended as long as you have more ideas? Is there such a thing as "too much choice," or is the wide variety of options—not just in terms of classes, but also feats, spells, and so on—one of the primary strengths of the Pathfinder RPG? I think variety is our strength, but that said, restraint is something we keep in mind. We don’t want the game to expand so quickly that players and Game Master leave entire systems untouched because of the pace at which we’re releasing options. It’s a tricky balance to pull off, but at three books per year (of core game material), I think we’ve got the right mix. As for more classes specifically, with each new class we put out, the room to fit in one more grows tighter and tighter. I would never say never to new classes, but we’re finding that we need increasingly stronger reasons to expand the current offering. So, the big question. You've already announced 8 of your new classes. What can you tell me about the remaining two classes from ADVANCED CLASS GUIDE? Up to this point, we have announced the arcanist (a mix of sorcerer and wizard), the bloodrager (a mix of barbarian and sorcerer), the hunter (a mix of druid and ranger), the investigator (a mix of alchemist and rogue), the shaman (a combination of oracle and witch), the slayer (a blending of ranger and rogue), the Swashbuckler (a mix of gunslinger and fighter), and the warpriest (mixing the cleric and fighter). But you knew about those already. Here are the last two. Brawler: This class blends the fighter and the monk, creating a warrior whose sole focus is unarmed combat and martial maneuvers, without any of the mysticism of the monk. This class is designed specifically to beat up monsters, with a full base attack bonus progression (like a fighter) and improved unarmed strike damage (like a monk). To top it off, the class is also very skilled at making combat maneuvers. Skald: Taking parts of the bard and the barbarian, this class can rage and inspire rage in its allies (we initially called it the “bard-barian” in-house). Instead of inspiring speeches and words of encouragement, the skald incites fury and anger in his allies, allowing them all to go on a murderous rampage. Put together, these 10 classes give players the opportunity to create a brand-new party of adventures. While their mechanics will feel new and different, their concepts are inherently familiar, allowing them to be seamlessly integrated into the game. The best part is, you don’t have to wait until August to try out these new classes at your table. The Advanced Class Guide playtest is about to begin. Starting on November 19th, you’ll be able to download the PDF containing all 10 of these classes for free from paizo.com and participate in the open playtest on our forums! Obviously ACG, being a big 256-page harcover tome, is more than just the classes. What else will we find in the book? Spells, feats, magic items, archetypes? As with our other books, we wanted to make sure that the Advanced Class Guide contained plenty of support for all of the new classes. You’ll find archetypes, feats, spells, and magic items suitable for all of the new classes. In addition, this book will contain a wealth of new toys for characters that belong to our existing classes, including archetypes that let them experience some of the new mechanics, feats that allow them to mesh with the new characters, and much more. Since the existing classes already have a wealth of material to draw from, we want to make sure that the Advanced Class Guide gives you plenty of tools to make a complete character using one of the new classes. You mention that the final chapter of the book looks at the design process for classes; that's a fascinating subject, and one I look forward to reading both as a player and as a third-party publisher of Pathfinder material. What can we expect from that chapter? This chapter is here to give a peek into our design process when it comes to class and archetype design. The goal is to provide GMs (and third party publishers) an idea of the art that is the design process. Class design isn’t really something that you do via a system or set of hard and fast rules, but there are a number of guidelines and tips that we hope fans of the game might enjoy. We hope that this will give GMs the inspiration to start designing their own classes and archetypes, with the confidence that they’ll work and be fun to play. You mention that class design is more art than science. If you had to come up with two or three guiding principles for class design, what would they be? Has your approach changed at all since you designed the core classes? Would you say you become a little less conservative in terms of new mechanics when introducing new class features such as the gunslinger's grit score? Can we expect to see any brand-new subsystems or mechanics in the ten new classes? I think you’ll have to check out the class design chapter for all of your answers here, but I will say that the design team as a whole has gotten a bit more experimental over the years. When I first worked on the core classes, much of the time was spent finding a way to expand options without altering the existing power dynamics (at least not unintentionally). Today we give ourselves quite a bit more play in terms of mechanics. This is especially true when we have an open playtest. We trust that if we stray too far, our playtesters will let us know (often quite loudly). It’s a process that never ceases to surprise me. Sometimes when I think we’ve gone too far, we learn that we may not have gone far enough. Other times something we believe to be obvious turns into a huge controversy. It can be difficult to gauge at times, but at least it’s always exciting. The significance of third party products to an Open Game brand like Pathfinder has been argued endlessly for years; some hold it as the sole reason for Pathfinder's spectacular success, while others maintain that they are practically irrelevant. Ryan Dancey certainly felt that open gaming was an important recipe for success when he introduced the Open Gaming License. What are your thoughts on the relationship between an open game and that game's long-term success and popularity? We love our third-party publishers and everything they do to support Pathfinder. Everybody at Paizo appreciates the hard work and dedication they put into making great products. There are a lot of fun ideas and concepts out there that are just a little too niche or far removed from our baseline for us to support them, and the third party crowd does a great job of servicing those needs. It’s a system that allows everyone to get what they want out of the game and get the support they need to tell the stories they want to tell. It’s a great relationship, and one that we truly value. 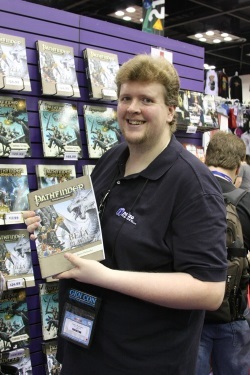 You have your own imprint, Minotaur Games, which you use to produce small Pathfinder RPG books. Would these be ideas that, for whatever reason, aren't likely to make it into an official Pathfinder rulebook; and if so, why not? What can we expect to see from Minotaur Games in the coming months? Most of what I’m doing with Minotaur Games is pretty niche. I’m using the imprint to explore some rules that are a little more off the beaten path in terms of concepts and mechanics. It’s also nice to be able to go from idea to finished product in a matter of weeks. It really allows me to move quickly on an idea that is exciting to me at that moment, which is something I don’t get as often through my other design endeavors. As to the future, I’m hoping to break into print next year, but since I’m a one-man show, I’ve got a lot I still need to learn. I recently brainstormed a small campaign setting on the Crucible of Realms podcast and I’m currently thinking about putting together some support for that setting. With the setting being released under the Creative Commons license, I’m hoping to set up a playground that other publishers can take advantage of as well. Psionics has been well covered by third-party publishers like Dreamscarred Press. Is that a subject that you can see Paizo tackling at some point? Personally, I like what Dreamscarred has done with psionics, and I wouldn’t want to come in and do the exact same thing. I think if Paizo ever decides to look into psionics, we’ll go in a different direction. It’s not currently in our plans, but I wouldn’t rule it out in the future. There's a danger with RPGs that—as the years go on—products start to become more and more niche and sell in smaller numbers, and arguably it was one of the things which killed TSR. So far this hasn't happened with Pathfinder; how does Paizo protect itself against that, and do you guys feel you still have many places to explore with the system? I think we have the right mix of products and enthusiasm to keep us going. One of our core strengths is that we support every aspect of our game, with product tie-ins and added material from various lines. When a new Adventure Path comes out, you’ll see a Pathfinder Campaign Setting book tied to the region, and a Player Companion to give your PCs some options. It requires a lot of planning, but it means that we don’t divide up our own audience into multiple different camps. It lets us focus our attention on individual topics, which leads to better adventures, settings, and rules. Thanks so much for taking the time to answer my questions, Jason. It's been a pleasure! Thank you for the opportunity. If you get the chance, check out the playtest for all 10 of the new Advanced Class Guide classes. You can download the PDF for free starting on November 19th at paizo.com!